A few weeks ago I was interviewed by a Turkish magazine called Igne Iplik (Needle Thread) Magazine of Tuva Publishing, and received a copy of the interview. I was so impressed with the quality and content of the magazine that I asked the editor Kader Demirpehlivan to tell us more about their magazines and thought I would share this with you today. The embroidery projects in the magazines are truly beautiful, if you are interested in obtaining a copy of the magazine you can email Kader kader@tuvayayincilik.com she is English speaking. Although the instructions are in Turkish the diagrams are clear and easy to follow and use DMC threads. Because of the vast number of photographs on Turkish embroidery I have provided these as a gallery below – you can click on each thumbnail to get a larger view. PS as a matter of interest Tuva Publishing has published my book Crewel & Surface Embroidery in Turkish! Can you tell me more about your magazine publications – how many publications do you have, are they all embroidery magazines? Tuva Publishing has three magazines- they are published quarterly. Igne Iplik (Needle Thread) Magazine: It contains embroidery projects, step by step techniques, interviews, news from needlework events etc. Although it is an embroidery magazine, it features also patchwork, appliqué, rarely sewing and knitting projects. It contains especially professional techniques and projects. The magazine’s slogan is “everything made with needle and thread”. Igne Iplik readers and fans especially show an interest in Brazilian embroidery, ribbon embroidery, goldwork, crewel work, needle painting, three dimensional embroideries, stumpwork, and traditional Turkish embroideries. It is the most popular embroidery magazine in Turkey and has high quality with photography, projects and its style. 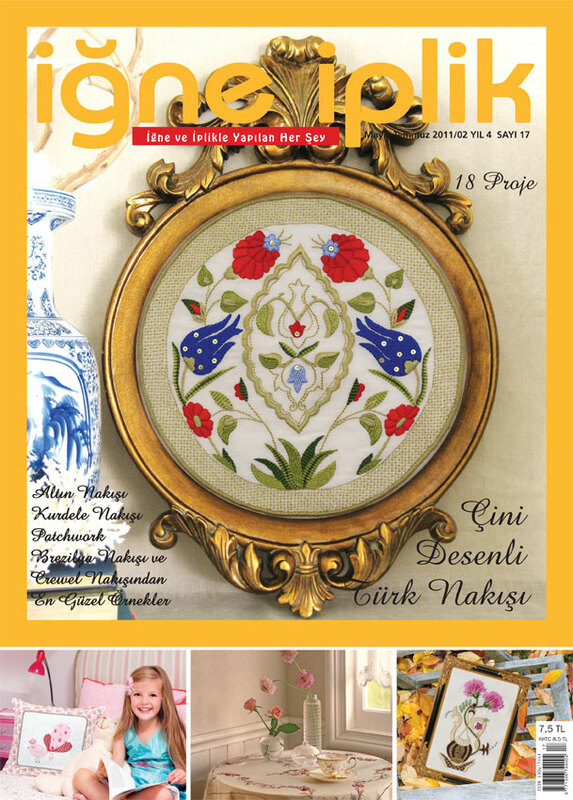 Some European embroidery magazines publish Igne Iplik projects purchasing its copyright. Wall hangings, tablecloths, cushions, curtains, runners are the most interesting items used in the magazine. It has 17 issues. Kanaviçe (Cross Stitch) Magazine: Kanaviçe which means cross stitch in Turkish language is a premium cross stitch magazine offering large and involved projects from the best designers around the world. It is 6 years old magazine and has 82 pages. Most popular cross stitch designers make special designs and projects for the Kanavice magazine. Each issue is packed with detailed cross stitch projects, beautiful photography, easy to follow charts. Designers are mainly from England, France, Germany, Turkey, and Ukraine. It is also most popular cross stitch magazine in Turkey and has fans from foreign countries. As well as internationals designs, there are some designs like calligraphy, traditional kilim- rug and tile motif unique to Turkish culture. It has 23 issues. 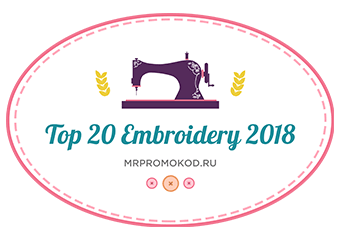 Elisi (Handwork) Magazine: It comprise from all kind of embroidery projects come from embroidery teachers, students in courses and embroidery enthusiasts. Editors accept only the most beautiful and suitable pieces among projects which come from the readers. At the same time Elisi magazine gives opportunity to readers and needlework enthusiasts to share own pieces and embroideries with other readers. It has 5 issues. Except magazines, Tuva Publishing has published various books regarding ribbon and Brazilian embroidery, knitting, sewing, cross stitch, embroidery patterns, goldwork, hardanger, Turkish embroideries, embroidery stitches and techniques. Tuva Publishing is well known with the quality of the needlework publications in Turkey. What exactly is your job at the publishing house and what do you do? I am publishing and creative editor in Tuva Publishing (By the way, Tuva Yayincilik is the Turkish name of the publishing house). I find designers and authors for our publications and I also follow the craft and needlework trends in Turkey and in the world. I also follow new publications, products and styles in our area. I give new commissions for the cross stitch magazine Kanavice and embroidery magazine Igne Iplik. According to new trend and styles, I lead the embroidery teachers and our designers. Shortly I am responsible for new ideas and projects as well as revising final state of the publications before released. I also sometimes make some cross stitch designs for Kanavice magazine. Can you tell me a little of what is involved in publishing an embroidery magazine? First we decide what kinds of embroideries would be featured in next issue. After that we gave commissions to our designers or stitchers. Designer comes with some rough originals ideas and sketches to us and we negotiate these ideas together. Then more or less what kind of design will come up is obvious. According to these points, designer or stitcher realizes final state of the embroidery and finishes up. After finishing the embroidered piece, designer or stitcher sent the piece to us with step by step instructions and drawings – patterns of the embroidery. And then next step is photography. After ambiance and close-up photography, we pass to lay-out of the magazine. This means our graphic department place photos and instructions to magazines. After finishing all lay-out of the magazine, cover design is completed. So document is sent to printing house for the digital printing. After revising the final state of the magazine, printing house print the magazine. Shortly we follow these steps for publishing an embroidery magazine. Do you have a large following of embroidery in Turkey, what is the most popular kind? Embroidery is very old cultural legacy in Turkey from the times of the Ottoman Times. There are lots of traditional Turkish embroidery types and they are still made by students which attend to Public Education Schools and embroidery courses today. Antep work, Maras work, Tel kirma, Hesap work, Turkish work, Cin İgnesi (Chinese needle) are some of them. These techniques require special training and patience. Except that modern and foreign embroideries have large followers. According to Turkish tradition, trousseau and marriage portion are prepared for couples who want to marry before the marriage. Among the trousseau, there are lots of embroidered items like home textiles, garments, prayer rug etc. some of them are given to relatives of bride and groom as gift. Today this tradition is still alive and so that embroidery is still very popular thing in Turkey. Of course there are lots of people who see embroidery and needlework as hobby and leisure time activity. Foreign embroideries are very poplar also. Ribbon embroidery, Brazilian embroidery, Crewel work, Schwalm white work, Mountmellick etc. are examples of foreign embroideries. The most popular kind embroidery is Brazilian embroidery but in time people tried various embroideries and now prefer blending all techniques in a piece. So you can see very interesting examples contains mixed techniques. In a word, we can say, there is a serious needlework boom in the last seven years. And of course Tuva Publishing contributes this booming greatly. We are the only professional publishing house which publishes needlework books and magazine in Turkey. Can you tell me a bit about Turkish embroidery and its traditions? Motifs taken from nature are widely used in Turkish embroideries. For example; tulip, carnation, rose and hyacinth motifs are very popular. Plants, living beings, objects motifs, ornaments, scripts and archeological art works are also used. Turkish embroidery motifs can be grouped as follows: Vertical motif, straight motif, and diagonal motif. Colour is very important in Turkish embroidery. Colours used in Turkish Embroidery are: Deep Blue, navy blue, oil green, cinnamon, blue, straw-colored, light yellow, dark red, light pink, orange, greenish blue, turquoise, olive green, brown, mustard, black, white, shy blue, gold and silver. Colours can be divided into two groups according to their brands and use on embroidery: Main colours and Subsidiary colours. Generally there is one dominant color in embroideries, and subsidiary colours support this main colour. since this this web page conations really pleasant funny material too. and on web I found this web page as a most excellent website for most up-to-date updates. naj stranice za reklamiranje apartmana koja sadrži pregršt odličnih ideja. It’s actually a great and useful piece of info. I am happy that you simply shared this helpful info with us. Do you know anything about Turkish punch needle embroidery? I bought a contraption (about 10″ high) many years ago and have never used it. The directions are of course in Turkish. Some of this embroidery shown is absolutely exquisite. I aspire to get half as good as them, then I could die happy. This is great Trish – the multi-culturalism and the work. Isn’t Google wonderful? Not so long ago we wouldn’t have the first clue about any of this but now with the click of a button all is translated and an embroiderer from South Africa (?) appears in a Turkish magazine. Turkish embroidery is delightful: some of the pieces here are very reminiscent of the decorated plates and bowls stocked in our local (country Australia would you believe) Turkish shop, and others show the beautiful oya work that seems to be unique to Turkey. Where do you expect to pop up next? Russia, perhaps? Keep up the great work. This is Heather Basson from the C.E.G. We had one of our members who lived in Turkey while her husband was teaching there, pop in and see us last meeting, and she brought the mags with you work and book translation info for us to see. Beautiful and wonderful to know that your work, and I think Vias was also shown , is touching the hearts of others in many parts of the world and that it has been translated for them to be able to work from. Their Magazines are amazing! !